One day in the early 1990s, two teenagers received $3,000 checks in the mail from a woman they’d never met. The boys’ parents had casually known Louise Peck for 25 years. 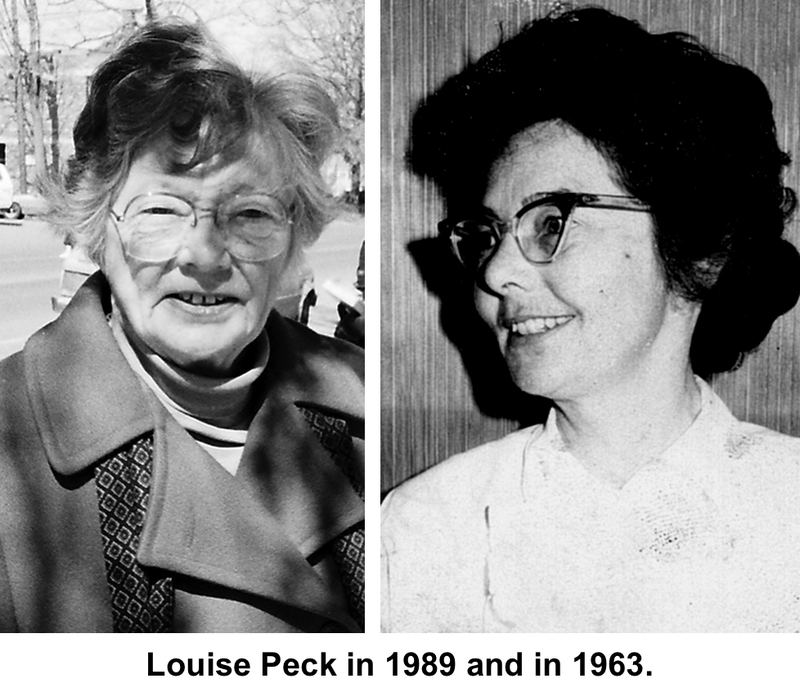 Peck later told the parents she had seen the boys walking to school for many years, admired the fact that they walked instead of taking the bus, and wanted to help with their college educations. It was just one small example of the kindness – often unexpected or unusually generous – of a woman who gave away literally millions of dollars. She did so quietly; Peck was much better known as a vocal conservationist, who fought for land preservation long before it was popular. She spoke at meetings, wrote letters, served on the Conservation Commission for 11 years, was a supervisor of the Fairfield County Soil and Water Conservation District, and belonged to the conservation committee of the Ridgefield Garden Club for years. She sometimes got in trouble. In 1980, Peck was nearly take to court for libel after she wrote a fiery letter criticizing Casagmo/Fox Hill developer David Paul and his plans to build more condominiums on Danbury Road. Louise D. Peck was born in 1919 in New York City where she grew up and graduated from Barnard College of Columbia University. Her major in English served her during World War II when she was in the Women’s Army Corps. An instructor stationed in Goldsboro, N.C., from 1943 to 1945, she taught sometimes illiterate recruits to get their English up to at least sixth grade levels. It was during her Army years that she met Grace Woodruff, who was to become her lifelong companion. “Woody,” who died in 1994, shared Peck’s desire to find a place in the country and the two came here in 1946, eventually buying a home on North Salem Road — which they called “Woodpecker Hill,” an amalgam of their names and their interest in birds. During the 1950s they operated a music store on Main Street, selling records, radio, sheet music, and some instruments. Besides conservation work, Peck served on the library board, was a director of the Ridgefield Symphony Orchestra, and a founder of the NAACP chapter here. A poet, her work was published in such magazines as Harper’s, and in The New York Times, for which she also wrote gardening and natural history articles. For many years she and Woodruff raised sheep at Woodpecker Hill, a fact reflected in the title of her book, “Lambing and Other Poems,” published in 1979. Peck donated 10 acres at Turtle Pond and later most of her own homestead on North Salem Road to the Land Conservancy of Ridgefield. She not only fought for, but also lived conservation. Although she was well-to-do, she owned a small house and drove just about the tiniest, most economical cars she could find. Her own property was a wildlife refuge, full of fields with bluebird boxes and edged with plantings that were food and habitat for birds and other creatures. After her death in 1999 at the age of 79, it was revealed that she had bequeathed more than three million dollars to such organizations as the Ridgefield Library, Keeler Tavern Museum, and the Ridgefield Symphony Orchestra.